As befits a leading member of the Indian prime minister’s National Security Advisory Board, Pramit Pal Chaudhuri in his rejoinder adeptly lays out the nuances of India’s China policy—and highlights how New Delhi has leveraged strategic partnerships with Washington and Tokyo against Beijing, not as part of any containment alliance but to give India space to pursue its independent interests. He is correct that a Chinese strategic establishment inclined to look down on India takes India much more seriously when it combines its weight with first-tier powers like the United States and Japan, and he accurately describes Prime Minister Narendra Modi’s ambitions to catalyze Indian development through greater economic engagement with both China and Japan like other Asian nations and the United States itself. India is indeed hedging—pursuing trade and investment opportunities with what will soon emerge as the world’s largest economy even as China’s modernization generates security frictions that offset the reassurance otherwise provided by deep economic interdependence. For all China’s economic dynamism, Japan may ultimately prove more important to India’s modernization drive than China, as Chaudhuri hints. It is Japan’s investment in developing vast Indian industrial corridors that could lay the foundation for the mass-manufacturing base India lacks. It is Japanese companies, more so than Chinese, that view India as a platform for industrial production, both for what eventually will become the world’s largest internal market (in population terms) and for export. Nor do Japanese industrial titans present the same political risks to India as the state-owned enterprises, which sit at the summit of the Chinese economy. Their foreign investments and (sometimes failed) acquisitions have created well-deserved controversy on national security grounds—precisely because the Chinese private sector is not always “private” but can act as an arm of the Chinese state. By contrast, the comfort level between New Delhi and Tokyo not only renders such concerns irrelevant but could even lead to Japanese export of defense technologies and military co-production arrangements of a kind difficult to imagine between India and China. Nonetheless, India’s underdeveloped economic relationship with China is an aberration that deserves the Modi administration’s focus; after all, China is emerging as every other major economy’s first or second trading partner on account of its sheer scale. The paucity of India’s economic linkages with China as compared to those of China with other Asian and Western economies is even more striking given that India and China share one of the world’s longest borders. Straitjacketed economic ties are a reflection of the simmering mistrust that will continue to characterize relations between Asia’s rising civilization-states even as trade and investment between them grows. Modi will face a tricky balancing act as he solicits Chinese trade and capital to make India stronger and more capable—even as one imperative for doing so is to compensate for India’s economic weakness relative to its giant neighbor and the growing security dilemma this has produced for New Delhi. India’s economic engagement of China will, therefore, be somewhat Janus-faced: an economic embrace designed to tilt the balance of power between them slightly less in China’s favor by creating a broader Indian resource base not only for national development but for military modernization. India’s hedging on China is sustainable as long as other countries, like the United States and Japan, are also pursuing it—and so long as hot conflict does not break out in Asia. But Beijing under Xi Jinping seems determined to goad Japan into a limited, but nonetheless highly dangerous, conflict over control of the disputed Senkaku Islands, claimed by China but administered by Japan. Such a contingency could create pressure on New Delhi to choose between Tokyo and Beijing, although India’s natural tendency will be to hope to sit on the sidelines, as it currently does on too many foreign policy questions. The same tensions will build should Chinese maritime disputes with Vietnam, a close Indian military partner in Southeast Asia, turn hot. Meanwhile, China’s growing influence (often for reasons of energy security) in Pakistan, Afghanistan, Iran, and the Gulf States could divert New Delhi from its own “Look East” policy as China “Looks West” into India’s backyard. Indeed, Chaudhuri may underestimate the structural tensions that seem inclined to produce greater frictions between India and China over the coming years. These include their simmering border dispute, China’s growing footprint in India’s South Asian neighborhood, and the expansion of China’s naval presence in the Indian Ocean. Leadership is about elevating human agency above such structural pressures, and it may well be true that neither Modi nor Xi view India-China conflict as being in their country’s interest, but the imbalance of power between India and China and the assertiveness that has recently characterized Chinese behavior to its east could easily spill over in ways that produce new tensions on its south and west. Balance-of-power logic alone cannot explain India-China frictions, in part because each country is implicated in the other’s domestic politics. India is complicit in China’s domestic insecurity by virtue of New Delhi’s strong support for Tibet; India’s hosting of the Dalai Lama and the Tibetan government in exile has done more than anything else to keep alive the movement for Tibetan autonomy during long decades of fierce Chinese repression. For its part, China is complicit in supporting a Pakistani “deep state” that has produced waves of terrorism against Indian civilians. In the past, Beijing has been suspected too of arming and sponsoring insurgent groups operating out of Burma that sought to bleed the Indian state in its vulnerable northeastern reaches. China has appeared to support the secession of Indian territory in Kashmir, issuing its residents “stapled visas” that do not acknowledge Indian sovereignty, and Chinese officials have stepped up their claims to the Indian state of Arunachal Pradesh, leading then-candidate Modi to visit the state to promise to stand up to China’s “mindset of expansion.” In short, each country’s contestation of the other’s sovereignty adds an element of instability to what remains a quiet but acute security competition between them. Finally, Chaudhuri helpfully acknowledges that India’s orientation toward China will be influenced in part by the role of the United States. If US policy toward China is wobbly, or if America is simply less present in Asia than it used to be as the Obama administration steers the ship of state without a strategic rudder, Indian calculations naturally will be affected. If American power appears resurgent, given long-term trends like the energy revolution and leadership of the innovation economy, Washington will be a more attractive partner to New Delhi than if US leaders accept a state of genteel decline that is more psychological than real. Equally, the calculations of Chinese leaders will be shaped by their judgment of the trajectory of American power and purpose, and this will influence China’s behavior toward American partners, including India. At the end of the day, only the United States can play the role of spoiler of China’s continued ascendance. India and other Asian nations have an enduring interest in working with the United States to ensure that China’s rise takes place within a balance of power and values that remains favorable to their interests. India need not be a formal American ally. But to expand the capabilities that will allow it to protect its far-flung territory and interests against encroachment, India urgently needs to catch up after years in which China has raced ahead in economic and military terms. To begin to close the gap, New Delhi will need help—including from the world’s leading sources of economic and military technologies and its deepest pools of capital, the United States and Europe. In short, Modi’s “Look East” economic policy to spur India’s modernization will benefit from expanded partnership with the West. I have read with great interest all three pieces by Daniel Twining on “India’s New Leadership and East Asia.” These engage in a very timely debate and seem grounded in a balanced approach, calibrating clear coverage of issues and contentious perspectives. But beyond complimenting Dan for his lucid analysis, let me add a few divergent notes for his consideration and possibly elicit some responses. First, his contributions are clearly located in the euphoria of unprecedented outcomes of India’s 16th general elections. For the first time since 1984, a single party gaining this kind of a clear majority and also defeating the Congress Party make these elections unprecedented. Daniel makes a convincing case of this change being deep-rooted, given that half of India is under 25 and two-thirds under 36 years of age. Also the fact that 551 million Indians actually voted in these elections makes it decisive. But foreign policy has rarely, at best only recently, been an issue in India’s elections. Second, this is one area which has enjoyed unusual consensus among all major political parties, barring fringe groups or views of fringe themes. Third, increasing federalization of Indian politics and three decades of coalition governments have made continuity, not change, the hallmark of India’s foreign policy. This inertia is not likely to shake loose easily. Second, historically the foreign policy of the Congress governments have always focused far more on the global scene and given priority to great power relations—this explains Rajiv Gandhi’s path-breaking visit to rising China in December 1988—, but the Hindu nationalist parties have always focused on India’s immediate neighborhood, which is confirmed by Prime Minister Modi’s recent initiatives. Given the changes in India’s internal and external circumstances, this narrow focus may be expanded this time to the extended neighborhood but nothing more than this. Modi is not likely to stake his government’s survival on any possible deal with Washington. If anything, he could be more circumscribed by his party’s ideology and its circumstances. Even with China his focus will remain on building economic ties, pushing the border issue to the margins of their complicated relationship. Third, I take note of a few specific issues that are difficult to get one’s teeth around, let alone digest and internalize. Some of these may be explained by the author, perhaps, being caught relatively off guard in his second and third pieces responding to rejoinders, and also by him trying to drive home his points without being understood so easily. These seem to push this article on “India’s New Leadership and East Asia” into narrow China-India polemics. For instance, the author uses expressions like a “simmering border dispute,” involving regular “skirmishes” on the China-India border, and “New Delhi’s strong support for Tibet,” and China granting stapled visas “to support the succession of Indian territory in Kashmir.” He even talks of India supporting the North Vietnamese in the 1960s and of India’s military alliance with Moscow in 1970. My personal favorite is the cliche of 800 million India’s living under USD 2 a day. I briefly respond to these in reverse order. The last comment seems misplaced and clearly misses the logic of purchasing power parity. The almost decade-old nation-wide scheme under the Mahatma Gandhi National Rural Employment Guarantee Act expects the Government of India to revise the minimum wage on an annual basis and the revised daily wage for 2013-2014 is USD 3.50. This scheme assures employment but only for seventy days a year. According to the recent order of the Government of the National Capital Region of New Delhi in April 2014, the minimum wage for unskilled wage labor is fixed at approximately USD 5. Surely, in a family (average of five members, i.e., one old person and two children), two adults being employed for all 365 days will mean USD 2 a day. Matters seem more complicated than can be explained by using binaries or cliches. China does not issue stapled visas to all Indian citizens living in Kashmir valley, which is part of India’s Jammu and Kashmir province. Random sampling seems to be the only logic, which may be rarely calibrated. And this being China’s support for “territorial succession” seems like stretching it beyond belief. So is India’s support to Tibet, which ended in the mid-1970s, and even the Dalai Lama’s dialogue with China has been deadlocked since 2010. India’s treatment of Tibetans during the Chinese leaders’ visits would be a good barometer to judge this. “Simmering border dispute” and regular “skirmishes” seem equally misplaced. Even during the so-called eyeball-to-eyeball confrontation during April 2013, while retired generals and anchors on television were shouting for rolling out the tanks, political leaders were sanguine and soldiers on the border waving and smiling from both sides. No doubt, there are rare incidents of misunderstanding on the line of actual control (LoAC), but these are always resolved without tempers rising high. The contrast with the line of control (LoC) with Pakistan makes it an especially glaring example of tranquillity. In brief, the border dispute between China and India has come to be nothing more than a medium of signalling displeasure. The China-India border issue will be resolved gradually into insignificance by the process of de-territorialization of national discourse. Even in the worst case scenario, both sides have shown that they have better ways to contest and undermine each other than falling prey to 20th century crude military strategies. 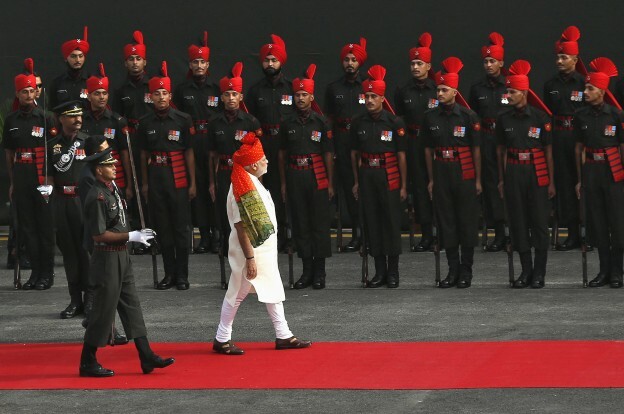 India’s elections and the new leadership can at best decelerate or accelerate momentum on a few sub-themes, and they are not going to change India’s foreign policy in any substantial manner.